When the Second World War began In September 1939, the six young Jarman sisters were among the many children quickly evacuated from their London homes – in danger of Hitler’s bombers – and sent to the safety of the Sussex countryside. It was difficult for youngsters to be uprooted from their home and parents but the Jarmans were luckier than most: the youngest girl was under five years old, and thus their Mum was one of the few mothers allowed to go with their offspring. The Jarmans lived in working-class Bermondsey in south London near the docks that Hitler would indeed later attack. They were poor but at least they had had a little experience of bucolic England. For many evacuees from the grey-brick terraced houses in the maze of south London streets, the fields, trees, quiet roads and paths, cows and sheep of the countryside were a novelty. The six girls were Mary, 14, Joan, 12, Sheila, 9, Kathleen, 7, Patricia, 5, and baby Anne, born only that June. Their father, Pierce Jarman, born in 1884, was a meter collector at the London Electricity Board. He married Annie in 1924. The family was always short of money. Like the other kids, the girls played makeshift games out in the street. As the seven of them set off from London by train, they weren’t even sure where they were going. And with such a large family there was no guarantee that when they were allotted accommodation they would be able to stay together. They were allowed to take a suitcase each but the Jarmans couldn’t afford them and had to improvise with bundles: a ragtag mob, but so were many other evacuees. What’s more, apart from the trauma of leaving home, they were wholly ignorant of when they would be allowed to return. Astonishingly, in retrospect, the evacuation of Britain’s cities began immediately the war started, and in the first four days of September 1939 nearly 3,000,000 people were transported from towns and cities in danger from enemy bombers to places of safety in the countryside. It was the biggest and most concentrated mass movement of people in Britain’s history. Yet it would be some months of the “Phoney War” before war actually came to Britain itself. The Blitz began in September 1940. J.M. 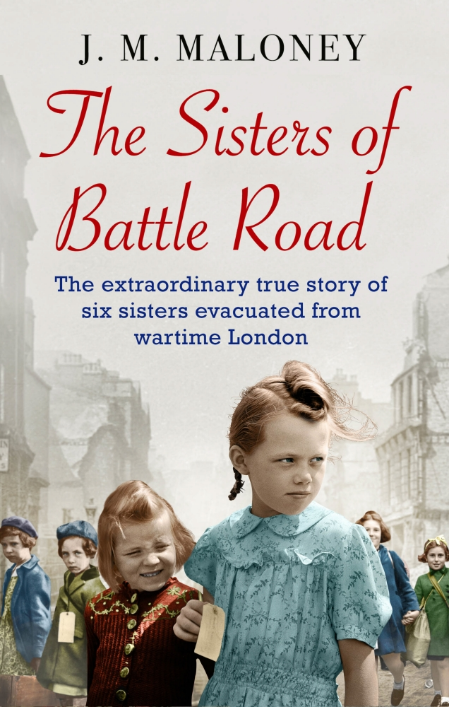 Maloney’s book is described as a true story of six ordinary girls in extraordinary wartime circumstances. The Jarmans already had a strong family bond in Bermondsey; uprooted from home and forced to make a new life in the unfamiliar countryside, the power of motherhood and sisterhood came even further to the fore. Mum Annie refused to allow them to be separated on arrival in Hailsham in Surrey, and they had to wait longer than most evacuees on camp beds in a church hall before a large empty house was found for them all, in Battle Road. The book is basically a simple nostalgic tale of the little incidents and larger traumas that faced the family: snobbery at school towards their London accents and their hardship, missing their friends, rats in the farmyard, getting stuck on a haystack, fear of cows and the good neighbour Miss Hunt who generously baked pies and cakes for them – all inedible. There are dances, romances and a family tragedy. It is also a story of war: rationing, the Canadian soldiers billeted nearby, the Home Guard, the Land Girls, the factory that made dummy Hurricane fighters in top secret for distribution to airfields around the country. Maloney is a professional writer and the son of one of the Jarman sisters, making him perfectly placed to tell the story of their experiences in the war. The book ends suddenly with the surrender of Germany and the Jarmans’ return to London, to Bermondsey but not their bombed former home. Having become immersed in the sisters’ fascinating tale, it would have been nice to hear more than the scant summary of their post-war activities. Volume Two, please!